ABOVE: The city of Chioggia, Italy, with the cathedral dominating the skyline. INSET BELOW: Moored sailboats in Sottomarina, and a pedestrian bridge in the historic center. "There is a stumpy winged lion on a pillar at Chioggia which has long been a joke among the Venetians--they like to call it the Cat of St. Mark; and a streak of pathos, an echo of ridicule, seems to infuse the life of this ancient fishing town, which still feels palsied, scabrous and tumble-down, and sunk in morbid superstition." "...Chioggia is a place of stubborn, sullen character. Its people have a cast of feature all their own, broad-nosed and big-eyed, and their incomprehensible dialect is said to be the language of early Venetian settlers, with Greek overtones. Their town is rigidly symmetrical, without the endearing higgledy-piggledy intricacies of Venice." Whether or not one shares Morris's rather nasty (and, to our minds, unfair) view of Chioggia, there's no denying that Chioggia is the second most important city on the Venetian Lagoon and the busiest fishing port in the region. Commercial fishing boats are moored along the waterfront, shellfish farms dot the neighboring waters of the lagoon, and the city's fish market is a popular tourist attraction. Just as important, the downtown business district and back streets have an almost 1950s feel,with seafood restaurants and cafés that haven't changed in decades and an atmosphere that suggests what the quieter neighborhoods of Venice might have felt like in the days before mass tourism. Chioggia is easy to reach from Venice, and a day trip or--better yet--an overnight excursion is well worthwhile if you can spare the time. Finally, Chioggia is the departure point for self-drive boat rentals from Locaboat Holidays, which offers "Penichette" cabin cruisers for one- to two-week itineraries in the Venetian Lagoon. 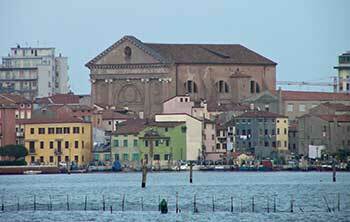 For practical information (including how to reach Chioggia and where to stay), see page 2 of this article.